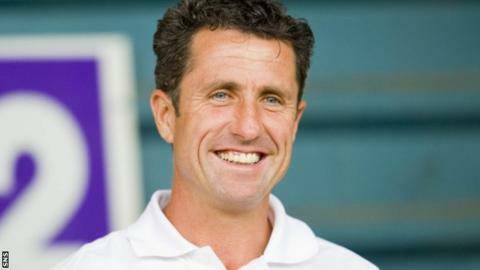 John Collins described returning to Celtic as an "honour"
Celtic have appointed John Collins as assistant manager to Ronny Deila. Former Celtic midfielder Collins, 46, described returning to the Scottish Premiership champions as "an honour". Collins, a former Scotland international, will assist Deila following his appointment as Neil Lennon's successor earlier this month. "It is a huge honour for me to return to Celtic, the club which has always been such a major part of my life," Collins told Celtic's website. Collins made 229 appearances for the club from 1990 to 1996 and also featured for Monaco, Everton, Fulham and Hibernian during his playing career. The 58-time capped Scotland international managed Hibs and Charleroi, and held the director of football post at Livingston. He said he was relishing the prospect of joining Deila's backroom staff. "I am grateful to Ronny for giving me this wonderful opportunity and I look forward to working closely with him and the players to ensure that we can continue to bring the good times to Celtic," he said. "I know what a great club Celtic is and I know exactly what the club means to our fans. "I will support the manager in every way and I am sure that together with our players, the backroom staff and the fans, we can all play our part in bringing success to the club." Deila expressed delight at his backroom appointment, adding: "I have had a number of meetings with John, I can see what the club means to him and I can see the qualities that he will bring to Celtic. "He is a first-class coach and has ideas on football which are very similar to mine so I am sure he will be a great addition to my team." Following Deila's appointment, Celtic chief executive Peter Lawwell said they were considering "three or four options" for an assistant boss. Celtic begin their next campaign on 15/16 July with a Champions League qualifier against an as yet unconfirmed round-two opponent.